This hardy perennial is winter hardy to -40F (-40C). Start with a purchased plant, or sow tansy from seed. These vigorous plants spread and reseed, so it is best to start with only one plant, and grow it as a managed clump. Locate in a spot where you can mow around the clump to further manage its spread. Tansy is an eager spreader wherever it is grown, but it is such an aggressive reseeder in some climates that it is listed as a noxious weed. Growing tansy is prohibited in Colorado, Minnesota, Montana, Wyoming, and parts of the state of Washington, as well as the Alberta and British Columbia provinces in Canada. Harvest leaves when needed, and expect flower clusters in late summer. Cut back plants close to the ground in early spring. 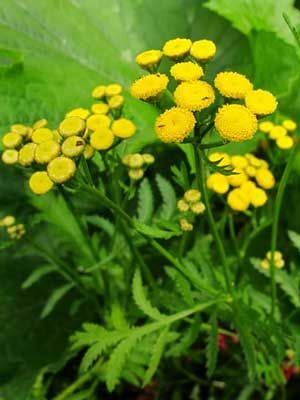 Tansy leaves can cause contact dermatitis in sensitive people, and the plants are poisonous to some animals when eaten.